A day of minor trades continues with a somewhat more high-profile swap between the Philadelphia Flyers and Arizona Coyotes. The third deal of the day sees forward Jordan Weal heading to Arizona in exchange for a 2019 sixth-round pick and ECHL defenseman Jacob Graves, as first reported by Sportsnet’s Jeff Marek and later confirmed by the teams. Weal is an impending unrestricted free agent. While it may seem strange that the Coyotes, just three points ahead of 30th-place Flyers in the league standings, are acquiring a rental player, one look at Arizona’s injury report will help to explain the move. The team has been without Christian Dvorak all season, lost Nick Schmaltz for the remainder of the year, have been missing Michael Grabner since early December, and today added Brad Richardson to the injured reserve. The team is sorely lacking in NHL-caliber forwards and found one in Weal for a relatively affordable price. Weal is likely to slide into a top-nine role for the Coyotes and could treat the opportunity as a tryout for a new contract, so as to avoid what might be a quiet off-season market for his services. Weal, 26, is just two years removed from a season in which scored better than a point-per-game in the AHL for a half season and better than a half point-per-game with the Flyers for the other half. At 24, Weal hit the open market as a Group 6 UFA, but Philadelphia paid to keep him around with a two-year contract worth $1.75MM per year, despite having less than half a season of NHL experience. He has fallen short of expectations as a full-time player, recording 21 points in 69 games with the Flyers last season and just nine points through 28 games this year, serving as a frequent healthy scratch over both campaigns. Where Weal has excelled this season is at the face-off dot, with an impressive 59.7% mark. He has also been a strong possession player, holding a 54.8 Corsi For % that trailed only Claude Giroux and Travis Konecny among Flyers forwards. The scoring has simply been lacking from Weal, an issue that the struggling Flyers could not afford to let him work out. While Weal may seem like just another depth piece on a Coyotes team filled with similar players, GM John Chayka will likely take a look at him in a variety of situations to see whether or not he would be a long-term fit in Arizona. Don’t rule out the possibility that he could be traded again before the deadline – or waived – if he gets off to a poor start. Regardless, Weal certainly wasn’t going to be a fit moving forward in Philadelphia and new GM Chuck Fletcher will be happy to land a draft pick for a player he planned to let walk. “We’re getting some players in place now that we think are going to continue to develop and evolve and be elite players in the NHL. Now we can go about building out our roster. I think the easiest thing to do in this situation is to wait and play it out and see what happens, and then if a lot of these guys come along as we hope and expect, then ultimately the way the league’s structured, you have to start making some trade-offs. While Arizona has been a team that has typically been towards the bottom of the league in payroll spending (though not necessarily in terms of cap hit), that’s something that’s going to change in the very near future. With those recent extensions, they already have over $60MM in salary commitments (and over $67MM on the salary cap) committed to just 15 players. As a result, their player budget is going have to be higher than it has been in recent years. In terms of players whose contracts are expiring this season, Chychrun was the last significant player they had to get locked up. Young wingers Brendan Perlini and Lawson Crouse are set to become restricted free agents in July but both players are likely to receive short-term bridge deals instead of a long-term pact. Looking ahead one year, center Clayton Keller is atop the list of players that will be on expiring contracts. Given their recent approach, it’s fair to suggest that they’ll be very aggressive in pursuing a long-term extension with him which can be done as early as July 1, 2019. Center Alex Galchenyuk will also be eligible to sign an extension at that time in advance of his UFA eligibility the following summer. New deals for those two will put even more money on the books so it’s understandable that Chayka is hoping to get some contracts done that will eventually prove to be below-market deals by their expiration and is willing to take some risk to do so. It’s clear that he believes that the core of this team is one that they can have long-term success with and if these extensions are any indication, the team is prepared to spend to keep it intact. In doing so, they won’t be near the bottom of the league in spending much longer. We are very pleased to sign Christian to a long-term contract. Christian is a highly skilled, reliable, two-way center who continues to improve each season. He will be a key player for us in the future and we are thrilled to have him with us for the next seven seasons. 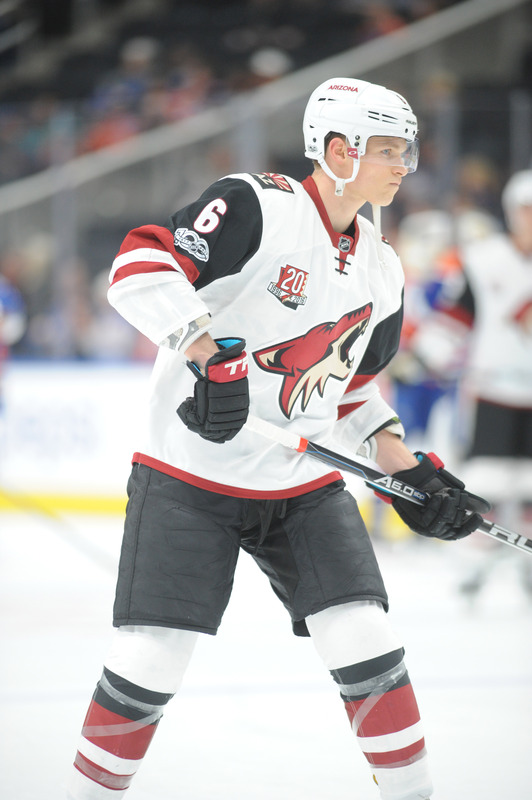 Dvorak was originally selected 58th overall by the Coyotes in 2014, but returned to the OHL for two more seasons to round out his game at the junior level. In those years, paired mostly with Mitch Marner (and often either Max Domi or Matthew Tkachuk) Dvorak became a dominant offense player and recorded 230 points in just 125 regular season games. He added 35 points en route to an OHL Championship and Memorial Cup in 2015-16 as team captain, before jumping straight to the NHL the following season. While some doubted that Dvorak could produce goals and points away from Marner and the other talented players on the London Knights roster, he scored 15 goals and 33 points as a rookie on a bad Arizona team and performed better admirably in the role that he was given. Those are big numbers for a player that still has yet to really have an offensive breakout, though they could look like a bargain down the road if he does. With the salary cap expected to continue to grow (though perhaps not at the same rate), a $4.45MM cap hit might become more than reasonable for a two-way center with Dvorak’s ability. Unfortunately right now it will be compared to some of his contemporaries who have produced at a much higher rate in recent years. CapFriendly’s tool indicates that Victor Rask and Rickard Rakell are the closes matches for the deal, given they each signed six-year extensions in 2016 at the age of 23 (the same age Dvorak will be when the deal kicks in). Rask and Rakell were each coming off 20+ goal and 40+ point seasons, thresholds that Dvorak has still yet to eclipse in his short career, and both come in at substantially lower cap hits ($4.0MM and $3.8MM respectively). Rakell has thrived after being moved to the wing with 67 goals over the first two years of the deal, and while Rask has actually taken steps backwards offensively in consecutive years his point production still sat right around where Dvorak was in 2017-18. The interesting part of a deal like this for Arizona though, is that the team normally doesn’t really have to worry about cap problems. Even after assuming dead cap hits like Dave Bolland and Marian Hossa, the team still finds itself with more than $10MM in space and one of the lowest salary totals in the league. Giving Dvorak a little bit extra in order to keep him in the desert long-term may have been necessary, and something that the team was obviously willing to do. Other teams around the league will likely feel the effects worse than Arizona when it comes to re-signing their own restricted free agents.